2m high x 1m wide. Celebratory panels for the Henley Management College, representing the pursuit of knowledge and growth within the harmony of its immediate environment. 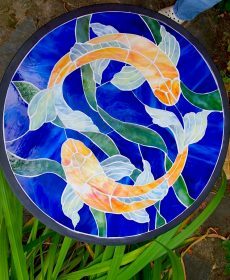 Mosaic bitro table featuring golden orb fish and pond scene. 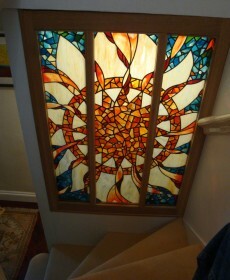 Stained glass window panel with painted glass touches. Transom panel over bedroom door. 0.8m wide x 0.3m high. 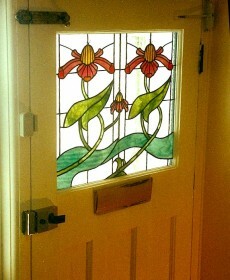 Transom panel over front door. 0.8m wide x 0.4m high. Two Devon-based stained glass artists – Maya & Jane – working to commission. 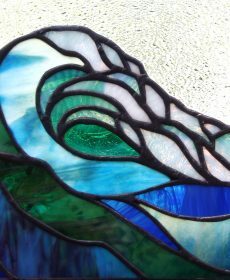 We design and create unique pieces of artistic stained glass and mosaic inspired by the shapes and colours of nature. We work on a wide spectrum of stained glass projects on varying scales and locations, from traditional to modern glass for domestic and architectural purposes. Please contact us if you would like to commission a piece of stained glass or mosaic, discuss an idea or speak to us about any aspect of our work. For smaller stained glass sun catchers and Christmas decorations, visit our Etsy shop online.